Under The Tree—who needed 35 runs from 18 balls—were buried by an aggressive Ground Works squad, after coming up nine run short in the thrilling Sunday afternoon encounter in Greenland, in the most competitive match of the Peter Haycraft Twenty 20 Cup Tournament. 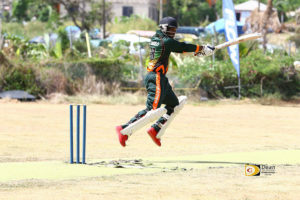 After his opening partner fell for less than 10, Ground Works opener Shakeem Charles and Mohammed Hassan, began a nine run per over run rate to reach the century mark before he was caught and bowled by Elroy Bracking for 67. Bracking who would be a key figure in the match, slowed Ground Works’ momentum, snatching 4 for 25, including Hassan for 37, as they lost 7 wickets for 89 runs and were eventually out for 195. Kenrick Leslie grabbed, 3 for 22. Under The Tree—mostly a group of players once spectators that sat under a Tamarind tree on the western end of Greenland before entering a team in the BVI Cricket Association league three years ago—matched Ground Works’ run rate during their chase. Leslie, who was caught for 49 off Hassan’s bowling, paced the early attack along with a supporting 35 from Shem Ellis. Off spinner Imran Smith snatched two crucial wickets including that of captain Emerald Prince for 20. Under The Tree reached 160 in the 17th over, ahead of Under The Tree’s pace, as a drizzle began to fell. Bracking hit two crucial sixes and a boundary for his 20, before Otis James was run out and Under The Tree finished with 186, nine runs short of their target. Under The Tree’s captain Prince, said James, the weakest batter should never have attempted a single when he was run out. In a must win game to keep their hopes alive during the morning match, tournament hosts Roadtown Wholesale earned a six wickets victory over the Virgin Gorda Spartans—who won the toss and went on to post 178 for 8. Daniel McDonald led the visitors with 59 before he was bowled by Murray Olliviere. Alvin Africa contributed 30 and was caught by captain Joel Williams at backward square. Two Roadtown Wholesale bowlers grabbed two wickets each, with Motinda Pope the pick of the lot taking 2 for 5. Olliviere snatched 2 for 29 and Delano Johnny, 3 for 34. In its best match after two critical losses, Roadtown Wholesale’s Austin McDowall came alive for a spirited 51, before he was caught and bowled by Clem Teleonaque, in helping his team chase down the target in 13.4 overs, losing only four wickets. Captain Joel Williams had a contributing 39 not out. Virgin Gorda Spartans’ Shane St.Clair, said it was poor captaincy and they faced other challenges.